This project is deployable on Raspberry Pi using BladeRF and allows for the creation and operation of a custom local GSM cell tower. The goal of this project is to create a private secure portable cell network utilizing basic technologies for mobile phones that can be easily deployable in any situation. In the event of an emergency, commodity cell networks can easily become severely congested and overwhelmed. Having the ability to set up secure and reliable communications for civilians or law enforcement can save lives, facilitate responses, and provide confidence in decision making. The radio system that we are using for the cell phones to communicate with is the GSM protocol (Global System for Mobiles) more commonly used by cellular provider such as AT&T and T-Mobile. To broadcast the radio system, we are going to be using a Software Defined Radio (SDR) device called the BladeRF (external). This hardware is controlled by the Raspberry PI (small single-board computer) (external) using YateBTS (external) which is software that implements functions and protocols of both the radio access network and the core GSM network to allow cell phones to communicate using voice, text, and data. The Raspberry PI is instrumental to reach our goals of portability due to its size, low power usability, and cost over alternatives. Click here for a photo-rich version of these instructions. Hit ‘Enter’ to accept the defaults on the next two screens, since they don’t apply. When you get past the last two steps you will be returned back to the main menu. On the next screen, press ‘Enter’ to go back to the main menu. When back at the terminal, run the command below to enable the configured settings. Now we are interacting with the Pi remotely. Let’s start gathering what we need for deployment. The script will check to make sure you’re running as root, so make sure you don’t leave out the ‘sudo’ portion of the commands below. The script will now initiate the installation and configuration process. This will take close to an hour so you can go find something to do in the meantime. When the script is nearing completion it will query for a new user password for the ‘pi’ user. Enter and re-enter this password to change from the default for added security. When the script completes it will report how much time it took to run and wait for a keypress to reboot. Press any key to reboot the pi. You will be rebooted into a desktop environment, simply select the ‘Default Configuration’ option at the pop-up that launches at first boot. A startup script titled ‘StartYateBTS.sh’ will await you in ‘/home/pi’ and will start the cell network processes. 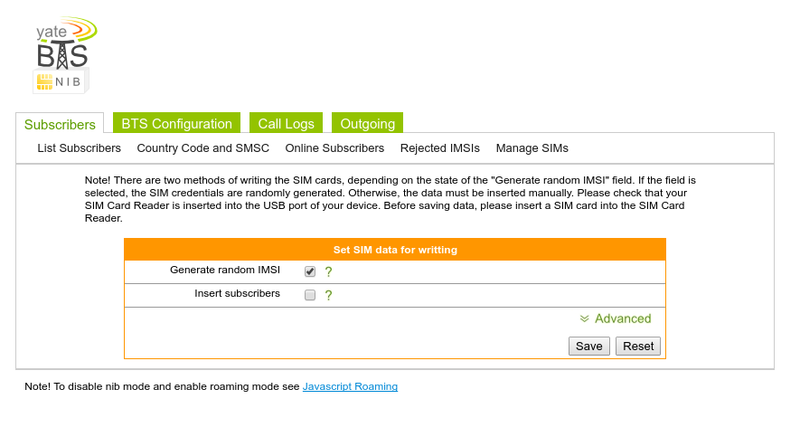 Here you can view/modify network configuration settings and manage/write SIM cards for devices. To join a compatible phone to the cell network, SIM cards need to be deployed to work with the correct settings. YateBTS uses a utility called PySIM, a python tool for programming SIM cards. In the installation script PySIM is already set up as the correct version that supports the SysmoSIM-GR2 card type. To start, make sure that the compatible SIM card writer is inserted into the Raspberry Pi with the SIM card to program already in it. 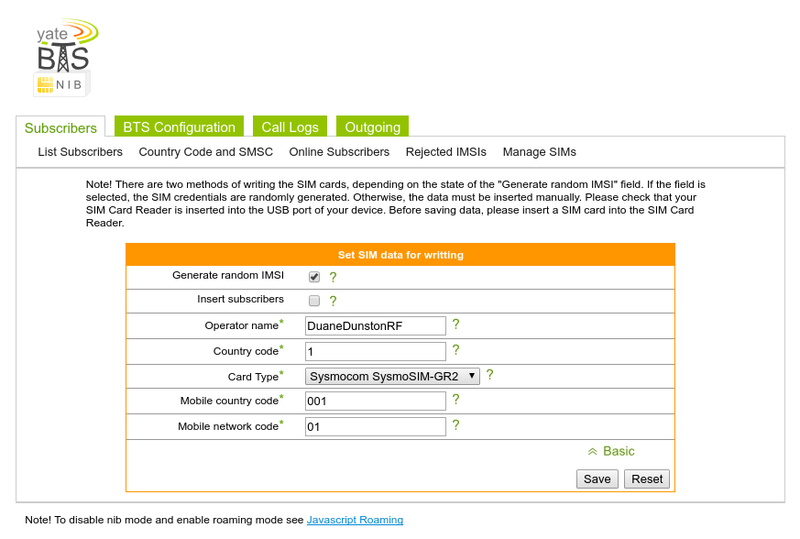 Open the tab called Manage SIMs as shown below and make sure that the Generate random IMSI setting is checked and the Insert subscribers is unchecked. The insert subscribers setting will break the functionality of the cell network and is recommended to avoid unless there is a fix for it. The next step is to check that the correct settings have been set in the Advanced drop down bar. Make sure the Operator name reflects the correct setting that was chosen for the cell network. Otherwise use the default settings and hit save. The screenshot below shows an example output that the SIM programming was successful. And lastly that the deployed SIM card shows in the Manage SIMs list. 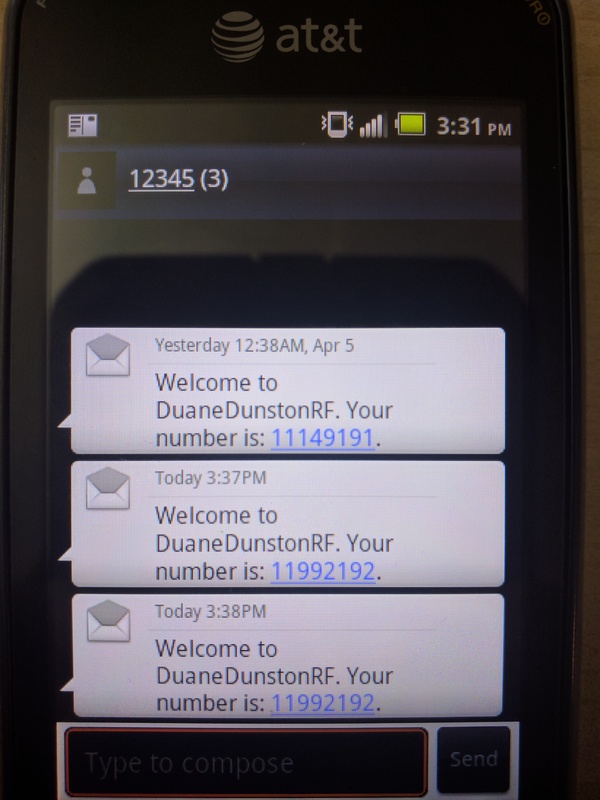 After inserting the SIM card into the GSM phone and powering on, YateBTS will send a welcome message with the assigned number for the phone as shown in the screenshot below. To troubleshoot if the Android phone is not connecting to the cell network properly, open the dialer application and type *#*#4636#*#*. 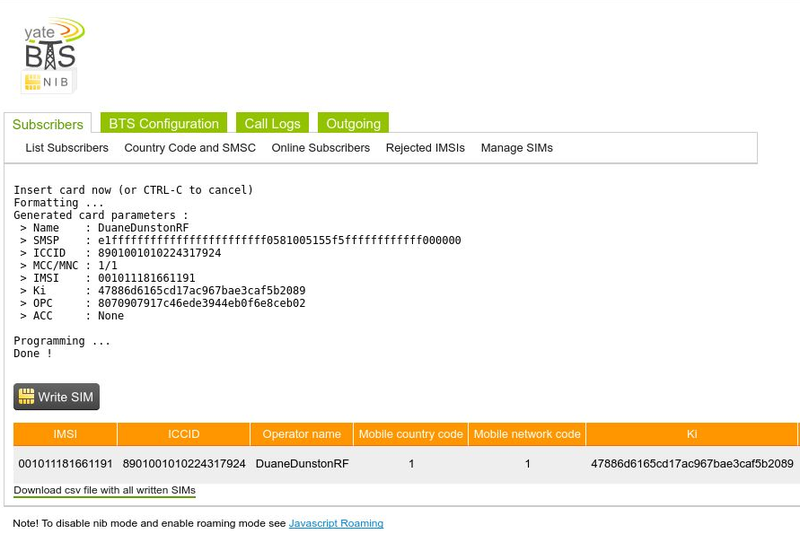 A menu will appear and in the phone information tab, select the preferred network type to be GSM only and restart the phone. A security model was implemented in our installation script based on the Center for Internet Security (CIS), which is a highly reputable source for best practice information security. The script incorporates a benchmark model designed for Debian 8 operating system. The Debian 8 operating system is the closest relating Linux distribution to the Raspberry Pi image, therefore we decided that this model was the best choice to use for reference. Originally, we did run into a set back with the security functionality of the Raspberry Pi because it does not support custom partitions that can implement security controls, such as full disk encryption and partition modifiers that deny arbitrary executions and protect against attacks that fill up disk space. The goal of the security script was to implement as many controls as we could while keeping the functionality of the Raspberry Pi operating system and the Yate software. The model follows the practice of disabling anything that is unnecessary to the functionality of the system to reduce the potential attack surface. Performing periodically updates and patches to fix security flaws can be a challenge for a system that is designed to be mobile and in areas where there may not even be access to the Internet. Rationale: Periodically patches contain security enhancements, bug fixes, and additional features for functionality. Rationale: Removing support for unneeded filesystem types reduces the local attack surface on the Pi. Rationale: The linux kernel supports uncommon network protocols that are unneeded for what our goals are for this project. Therefore they should be disabled. Rationale: A core dump is the memory of an executable program. It is generally used to determine why a program aborted. It can also be used to glean confidential information from a core file. Rationale: It is best practice for security to disable unnecessary services that are not required for operation to prevent exploitation. Rationale: The default password needs to be changed from raspberry. Strong passwords protect systems from being hacked through brute force methods. Password set cannot be a dictionary word, meet certain length, and contain a mix of characters. The Yate NIB setup includes an ELIZA chat bot that you can communicate with by sending SMS messages to 35492. This is a good way to test use of a single device.